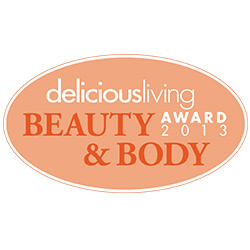 True Natural Delicious Living Winner - 2013 Beauty & Body Awards: Beyond excelling in purity and integrity—essential for any Delicious Living winner—these innovative natural beauty formulations deliver the highest performance yet. Among them, you’ll find time-tested ingredients upgraded and honest labeling improved—just two of many reasons to stock your HABA department with these winning natural beauty products. WHAT IS IT: The True Natural Baby and Family SPF 30	Sunscreen is unscented & water resistant. Perfect for babies and sensitive skin.As a winner of Delicious Living 2013 Beauty Awards: Best natural products, this baby sensitive formula is 100% natural, gluten free, nano-particle free, and fragrance free. Keep your little one & the entire family safe in the sun with broad spectrum protection and 80 minutes of worry free water resistance! Extremely gentle, Alcohol free and suitable for babies and those prone to skin allergies. This high performance, all natural and water resistant (80 minutes) sunscreen provides the ultimate in safe, long lasting sun protection for the whole family! Made with ultra-moisturizing Aloe Vera, Coconut Oil, Zinc Oxide and Titanium Dioxide, this gentle blend provides excellent protection against damaging UVA and UVB rays for the face and body. Beeswax helps this formula provide a full 80 minutes of water resistant protection. This sunscreen is both gluten-free, biodegradable and reef safe! Zinc oxide offers good protection from UVA rays – titanium oxide better than most other active ingredients.